The Lego Friends theme has been a wild success for Lego. The first truly successful “girls” line of Lego. There have been many other attempts by Lego to break into the “pink“ isle at the local toy store. But this has lead to a lot of criticism about the separation based on gender of Lego themes. And this segregation away from the other Lego sets certainly doesn’t help Lego keep a gender neutral position. There sure is a lot of pink, purple and tan in the Lego Friends theme, but the building designs, techniques and imagination involved are the same that makes Lego so popular. 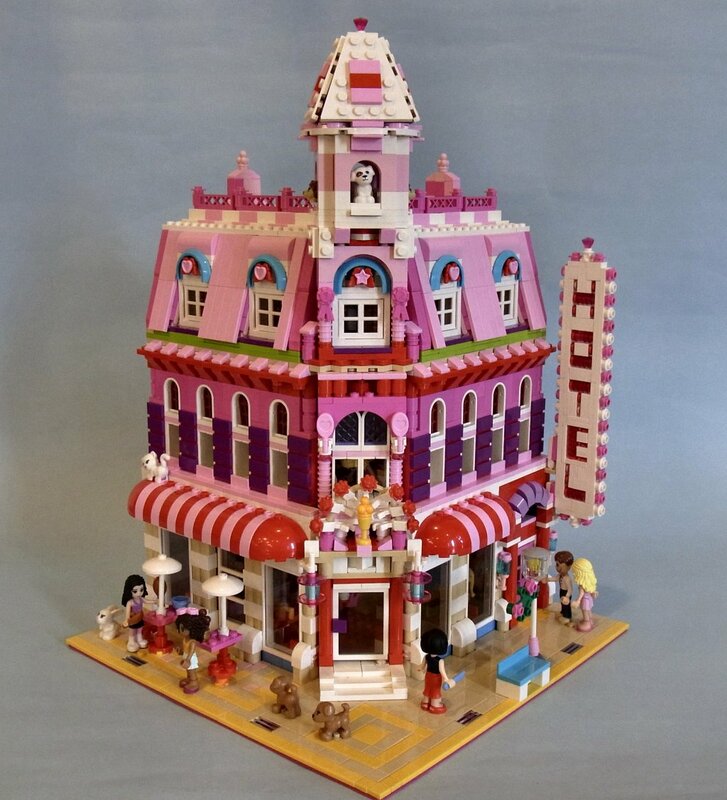 One of the most impressive Lego Friends MOCs is this Lovely Hotel. The actual design is almost an exact match to the famous Lego Cafe Corner (10182). The designer of this put a lot of work into modifying the Cafe Corner, and converting it to the Friends color scheme. With some really great ideas, such as using the hair decoration pieces for window dressing. Even the trademark entry sign has been recreated with flowers and ice cream (the original is made from ski’s and a coffee mug). It makes the ground level of the Lovely Hotel an Ice Cream parlor instead of a Cafe, which is a great fit with this theme. This whole build almost feels like it is made out of candy, and it could easily fit into a larger candyland theme. The site is in Japanese, so some details, such as the designers name are still a mystery. If you have any information feel free to leave a note. i wish i could have this how much is it. Sadly, I don’t think this is for sale. It is pretty neat, and if you have enough Lego pieces you could try building it. you might get it on ebay buy i am not sure so good luck finding how to get it ! do you know any where that sells it. 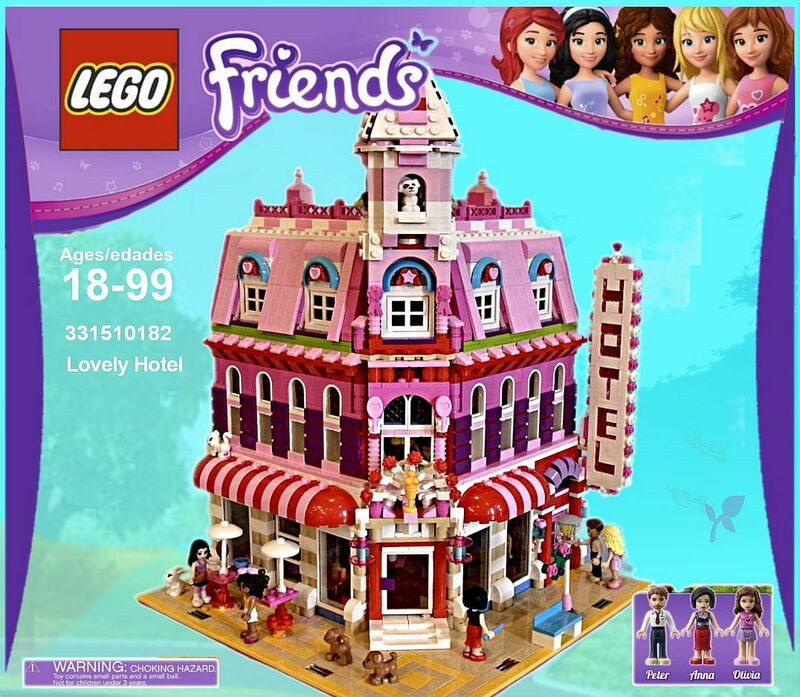 i can some speak engilish.im from iran and i like lego freind and i have olivia house .this is very pretty.i learn engilish .its good for learn then i go school engilish they called it:gooyesh nice to meat you and you? why dont u find how much it is on ebay ! how much does it cost? is it sold in Greece? Pingback: Lego Friends MOC: Mia's “Beauty” - Mia is ready to fly the skies! I would love to have this, how much is it. Is it available in retail store in Edinbourgh Scotland. Were can I buy it from in Australia. It’s wonderful !!! Wich lego pack did you use to do this ( how many café for example)? Where can you buy this lovely lego hotel?? I like the Lego set!! !